Interactive digital artworks produced by Japan’s teamLab have been capturing the imagination of people of all ages around the world. The 400-strong team of specialists such as programmers, engineers, mathematicians, architects, designers and animators produces beautiful, often surprising installations that alter the traditional viewer-artwork relationship, effectively transporting viewers into the art space itself. Take “United, Fragmented, Repeated and Impermanent World,” an interactive digital work in which natural motifs found in the work of the Edo-period painter Jakuchu Ito (1716-1800) are animated and viewed through fixed tile “pixels.” The viewer’s presence before the artwork causes the finely drawn moving grid painting to meld with the abstract world of square tiles. 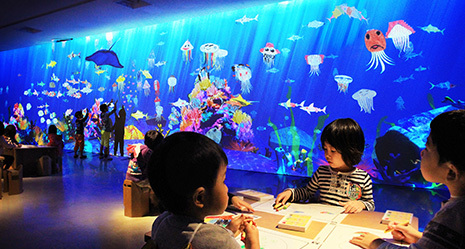 In “Sketch Aquarium,” visitors draw colorful sea creatures on paper which are then brought to life as projections in a virtual sea. Approach the screen, and the creatures will swim away. Works by teamLab have been exhibited around the world and have even been placed on permanent exhibition in such places as the ArtScience Museum in Singapore from this February. Among the celebrated works by teamLab is “HARMONY,” which was exhibited in the Japan Pavilion at Expo Milano 2015, helping the Pavilion to win the Best Presentation Prize. 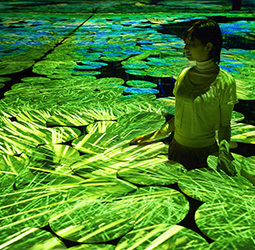 In this large-scale work, images of a rice field – so symbolic of Japan – are projected onto horizontal screens situated at knee to waist height like growing rice plants. The interactive projection space seems to spread out infinitely in all directions. As visitors walk among the screens, they feel as if they are wading through a rice field and become immersed in the experience of Japanese nature through the changing seasons. The digital artworks of teamLab often seem to express how Japanese people used to view the world through classical Japanese art. Inoko believes that just as contemporary Japanese people can recognize a three-dimensional space in a painting employing perspective, premodern Japanese recognized a three-dimensional space in Japanese paintings that look two-dimensional today. teamLab calls this space an “ultra-subjective space,” and its creators express it in the form of digital art that is not only experienced freely but which also changes as the viewer moves. 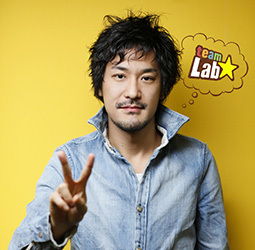 The unique view of the world is one more aspect of teamLab’s distinctive work and wide appeal.